Fall is my favorite time of the year! The chill in the air, the changing leaves, and the yummy flavors like apple cinnamon and pumpkin spice that can be found everywhere! Autumn also carries an air of mystery and romance to me, deep earth tones and rich spice colors are usually very popular during this time, which inspired me to create a makeup look tutorial for Fall! Before showing you how I achieved this look, I want to share with you about each of the products I used, why I love them, and explain their benefits to you. 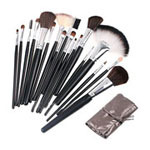 Having a terrific set of makeup brushes is critical when creating the perfect look. If you’re looking for a quality set of brushes and don’t want to break the bank, I highly recommend checking out Beauty Junkees 5-Piece Kabuki Makeup Brush Set. Flat Top Kabuki Makeup Brush: Perfect foundation brush for covering blemishes and imperfections, this will provide medium to heavy coverage. Angled Kabuki Makeup Brush: The angled top is perfect for contouring and applies blush flawlessly. Flat Angled Kabuki Makeup Brush: Combines the blending application of the Flat Kabuki with the contouring application of the Angled Kabuki. This combination allows for precision contouring anywhere on the face. Tapered Kabuki Makeup Brush: Highly recommended for concealer application; will provide coverage in hard to reach areas, such as the eyelid, corner of the eye and under the eye. Round Kabuki Makeup Brush: Created to work with mineral makeup and powder application. For a long time, I’d used more expensive brands of mineral makeup because I thought they would be more beneficial. On a whim, I decided to try Physician’s Formula Mineral Wear Talc-Free Mineral Loose Powder and I loved it! The coverage is actually better than some of the brands I’ve used previously. This is perfect for a breakout, acne prone skin that needs coverage! I also like that this mineral loose powder is hypoallergenic, fragrance-free, oil-free, Dermatologist approved, and non-comedogenic. Having the right blush and highlighter duo is essential for making your skin look fresh, healthy and vibrant. It brings the right pop of color and radiance to your face. Because my skin is very fair, I have to select my blush and highlighter wisely. I’ve had tremendous success with Beauty Junkees Twilight Dreams Powder Blush and Highlighter Duo. The Twilight Dreams Powdered Blush and Pink Parfait Highlighter are very flattering and add that perfect, natural flush of color to my cheeks. I love the Beauty Junkees Weekender Collection Eyeshadow Quad! These gorgeous, rich colors are perfect for fall and winter! Raspberry Glaze – bold red with deep brown undertones, punchy pink highlights, and a subtle frosted white finish. This kit supplied me with everything needed for the perfect fall palette. I’ll be able to use this kit repeatedly and try out all sorts of unique looks. The possibilities are endless with these pretty colors! I love The Balm ‘What’s Your Type’ Mascara in Bodybuilder because it always leaves my lashes looking plump and makes my eyes really pop. You can always find this in my purse, I never leave home without it! This formula is made with Vitamin E, Panthenol and Bamboo to strengthen and condition lashes. You can also double up on this mascara for that “come hither” false eyelashes look. To me, the right shade of lip gloss or lipstick is what ties the whole look together. Like eye-makeup, whether you chose a subtle or dramatic shade, it’s sure to make a statement. Wet ‘n’ Wild Megaslicks Lip Gloss in Bronze Berry is one my favorite shades for fall and is flattering on most skin tones. I like that this lip gloss is long-lasting and the color is very versatile. Before applying makeup, make sure your face is washed, dried, and moisturized. It’s always good to start with a fresh foundation for makeup applictaion. 1. First, we’re going to set the perfect canvas for our eye-shadow. Apply Peach Vanilla from the Beauty Junkees Weekender Collection Eyeshadow Quad from lash line to the brow bone. 2. Blend a little of Dash of Curry and Grizzily, sweep in the crease of the eye. 3. Apply Dash of Curry onto the lid of the eye. 4. Press and pat Raspberry Glaze onto the center of the lid for a pop of shimmer and highlight. 5. Apply Grizzily to the Outer V of the eye and smoke/smudge along the top and bottom lash line. 6. Apply The Balm ‘What’s Your Type’ Mascara in Bodybuilder to top and bottom lashes. I recommend applying a second coat for a “falsies” look that really makes your eyes pop. 7. I used the Beauty Junkees Round Kabuki Brush to apply Physician’s Formula Mineral Wear Talc-Free Mineral Loose Powder. Be sure to swirl and tap the excess foundation before applying. Then apply the foundation in a circular, blending strokes until the desired coverage is achieved. 8. Use the Beauty Junkees Angled Kabuki Makeup Brush and sweep a small amount of the Twilight Dreams Powdered Blush across the apples of your cheeks. Blend the color upward, out, and along the top of your cheekbones. Next, use the Pink Parfait Highlighter on the tops of your cheekbones (right above where you’ve applied the blush.) You may also apply the highlighter down the bridge of your nose, on your brow bone, and at the point of your chin. These are all places where the light would naturally illuminate your skin. 9. Finish the look by applying Wet ‘n’ Wild Megaslicks Lip Gloss in Bronze Berry to lips. I hope you’ve enjoyed this tutorial and learning about these products that helped me achieve this look. 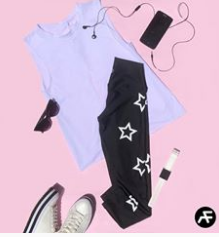 You can also purchase these products and create unique looks of your own. Beautiful! I don’t think I could do all that, however, I love that you put directions for each step so easier to learn to do! That’s a beautiful look! I’m a big fan of Beauty Junkees brushes and shadows. The rest of their products look to be pretty fine as well. Fall is also my favorite time of year. These colors are beautiful! I love them! I love all the colors especially in the lip gloss. Looks very nice. Beautiful! I wish I could get mine to look like that! Thanks for the instructions! I love all the warm fall colors! So beautiful! Beautiful! Those colors look great on you! Thanks so much for the how-to!! Thanks for the recommendations! It all looks really great on you! I love the lipstick color–maybe I need to change up the colors I am using with the season! These products are all pretty nice.